Part Number: 31832. Item model number: 31832. Tools are Made in the USA with Bondhus proprietary Protanium steel and are up to 20% stronger than competitor tools. Star long arm L-wrench sizes T6, T7, T8, T9, T10, T15, T20, and T25. Bondhus colour coded ball end hex key wrenches. Imperial Ballpoint Allen Key Set 13pc. Most parcels sent 1. Collection station availableBrand: BondhusType: Allen/Hex WrenchSize: 1/8in. Sizes 102mm Long Flat Ended x 40mm short Leg Plain Ended. Bondhus 7.0mm Short Hex Key - High Quality Protanium Steel - Black Finish. Bondhus 6.0mm Short Hex Key - High Quality Protanium Steel - Black Finish. Sizes 93mm Long Flat Ended x 36mm short Leg Plain Ended. Bondhus 8.0mm Long Hex L Key - High Quality Protanium Steel - Black Finish. Sizes 152mm Long Ball Ended x 35mm Short Leg Plain Flat Ended. Bondhus 10.0mm Long Hex L Key - High Quality Protanium Steel - Black Finish. Sizes 171mm Long Ball Ended x 39mm Short Leg Plain Flat Ended. All Made in the USA! Their is a Total of 84 Wrenches. 8.7" Total Length EDP #13160. Bondhus 4mm Hex Ball End. T-Handle Wrench. Made in U.S.A. Hand Tools. Threading & Thread Repair. Vises & Work Holding. Tool Holding. 5.9" Total Length EDP #13364. Bondhus Corporation. Monticello, MN 55362. Warranty Instructions. Made in U.S.A. They are Long Arm, Ball End, Plotanium Steel. All Made in the USA! Their is a Total of 25 Wrenches. 10.5" Total Length EDP #13168. Bondhus 6mm Hex Ball End T-Handle Wrench. Made in U.S.A. Threading & Thread Repair. Vises & Work Holding. Tool Holding. All Made In The USA. Their is a total of 84 Wrenches. 14" Total Length EDP #16460. Made in U.S.A. Threading & Thread Repair. Vises & Work Holding. Tool Holding. Sizes included: 1.5, 2.0, 2.5, 3.0, 4.0, 5.0, 6, 7, 8 and 10MM. Made with Protanium® High Torque Steel, which is up to 20% stronger, with more torque and twice the wear resistance of standard grades of steel. 4.7" Total Length EDP #13356. Made in U.S.A. Threading & Thread Repair. Vises & Work Holding. Tool Holding. This is a huge lot of 8mm, Allen L-Shaped, Hex Key, Ball End, Long Arm, Plotanium Steel Wrenches. Made in the USA! (This lot of 20) 10MM Allen Hex wrenches is Made by Bondus, they are all slightly used, as you can see in the pic's. 4.3" Total Length EDP #13354. Made in U.S.A. Threading & Thread Repair. Vises & Work Holding. Tool Holding. 5.3" Total Length EDP #13360. Made in U.S.A. Threading & Thread Repair. Vises & Work Holding. Tool Holding. 8.7" Total Length EDP# 75160. 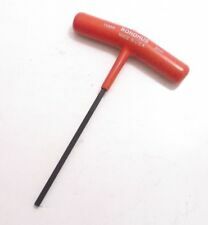 Bondhus 4mm Prohold® Hex Ball End T-Handle Wrench. Made in U.S.A. Threading & Thread Repair. Vises & Work Holding. Tool Holding. All the wrenches are Made by Bonhus, and Chesco. They are Slightly Used as you can see in the pic's. 12.1" Total Length EDP# 75176. 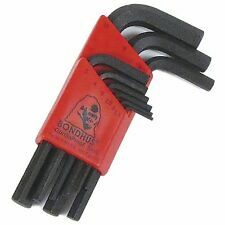 Bondhus 10mm Prohold® Hex Ball End T-Handle Wrench. Made in U.S.A. Threading & Thread Repair. Vises & Work Holding. Tool Holding. 11.2" Total Length EDP# 75172. Bondhus 8mm Prohold® Hex Ball End T-Handle Wrench. Made in U.S.A. Threading & Thread Repair. Vises & Work Holding. Tool Holding. 9.7" Total Length EDP #13164. Bondhus 5mm Hex Ball End T-Handle Wrench. Made in U.S.A. Threading & Thread Repair. Vises & Work Holding. Tool Holding. 4" Total Length EDP #13352. Made in U.S.A. Threading & Thread Repair. Vises & Work Holding. Tool Holding. 9.1" Total Length EDP #13376. Made in U.S.A. Threading & Thread Repair. Vises & Work Holding. Tool Holding. 6.8" Total Length EDP #13368. Made in U.S.A. Threading & Thread Repair. Vises & Work Holding. Tool Holding. 11.2" Total Length EDP #13172. Bondhus 8mm Hex Ball End T-Handle Wrench. Made in U.S.A. Threading & Thread Repair. Vises & Work Holding. Tool Holding. 12.1" Total Length EDP #13176. Bondhus 10mm Hex Ball End T-Handle Wrench. Made in U.S.A. Threading & Thread Repair. Vises & Work Holding. Tool Holding. 14" Total Length EDP #16456. Made in U.S.A. Threading & Thread Repair. Vises & Work Holding. Tool Holding. 14" Total Length EDP #16468. Made in U.S.A. Threading & Thread Repair. Vises & Work Holding. Tool Holding. Size - 24mm. Ball End - Long Arm. Made in USA. 14" Total Length EDP #16464. Made in U.S.A. Threading & Thread Repair. Vises & Work Holding. Tool Holding. 14" Total Length EDP #16472. Made in U.S.A. Threading & Thread Repair. Vises & Work Holding. Tool Holding. 10.5" Total Length EDP# 75168. Bondhus 6mm Prohold® Hex Ball End T-Handle Wrench. Made in U.S.A. Threading & Thread Repair. Vises & Work Holding. Tool Holding. Hex L Wrench Double Set Inch and Metric BND22199 Brand New! Part Number: 22199 BND22199. Sharp corners transfer more torque and reduces stripping. Made in USA. Color coded locking tool holders. Low profile short arm reaches screws with low overhead clearance, that are inaccessible with any other type of hex tools. Bondhus 16592 7pc Stubby ProGuard Hex Set 1.5-6mm, 16592. Stubby function-headed offset screwdriver bits for hard to reach screws where conventional fail tools. The "L" portion of the wrench is shorter than standard--the "Stubby" wrench will reach more easily into tight spaces. Sizes 89mm Long Flat Ended x 33mm short Leg Plain Ended. Bondhus 5.5mm Short Hex Key - High Quality Protanium Steel - Black Finish.